Virtually any seasonal product is now available on store shelves all year round. It would seem that winter harvesting has ceased to be a necessity. But the special taste qualities of raznosolov have a high value so far. After all, for example, knowing the recipe for cask tomatoes, you can prepare a snack with which even the overseas delicious dishes can not compete. 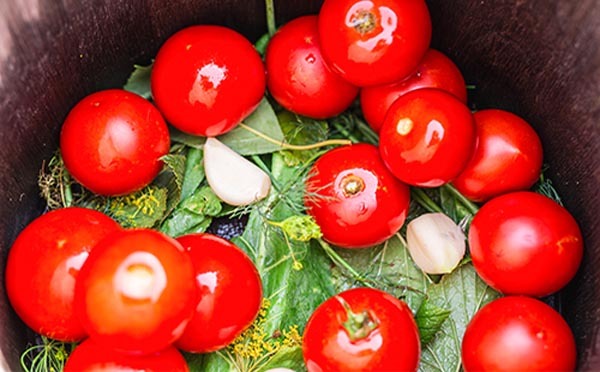 Aromatic fragrance, fantastic taste - that's what distinguishes homemade salted tomatoes and makes them "favorites" of a winter feast. Originally sour only cabbage and cucumbers. Several centuries ago, it was done without the use of salt. The fermentation process was started, but the blanks were not stored for long. Some researchers believe that the Byzantines learned to salve vegetables for the first time, and the Slavs already adopted methods from them. Over time, began to harvest mushrooms, berries, fruits, various vegetables and even beans. 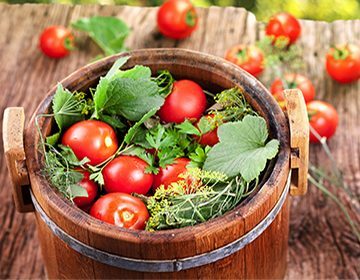 During the reign of Catherine the Great, a tomato was considered an ornamental plant, so it was grown in flower pots. In European countries thought that tomato is a poisonous fruit. It was even used in coups d'etat and they were trying to poison enemies. But such actions were unsuccessful. Such containers, as a barrel and a tub, are the most common options for storing pickles. Vegetables from them receive a special taste and aroma of wood. The barrel method is good because the process of lactic acid fermentation is active, as it should be. The containers are made of environmentally friendly and natural material, which is absolutely harmless. It is also able to prevent the premature appearance of mold, as it has powerful antibacterial properties. The shelf life of the pickles largely depends on how well the container was prepared. There are a number of activities that are mandatory. Soaking. The process is necessary for new products. But old tubs that have not been used for a long time can also be processed. To soak the container it is necessary for the plates to swell, and the small slots are hermetically sealed. Thus, the walls will gain the necessary density and reliability. The container is filled with water and stands until it swells. If this takes a long time, the liquid in it periodically changes. Disinfection. Disinfecting treatment is necessary both for new and old containers. It is carried out by rinsing with boiling water. Additionally, salt or soda can be used. They clean the inner and outer surfaces of the tree, and then carefully washed off. Tare with pickles stored in a cool, dry place. The room should not have negative temperatures, since frost will lead to spoilage of the workpiece. Put the tank on the floor is not recommended. It is better, if it will be on a wooden lattice or bricks. In the recipes of tomatoes in a barrel for the winter often uses the cold method of cooking. What does it mean? There is no thermal treatment of vegetables. Ingredients are poured cold water with spices, though sometimes pre-boiled. Features. Vegetables have a rich vitamin-mineral composition, that's why they are suitable for children's menu. Tomatoes do not burst and preserve a presentable appearance. Thanks to the "grandmother's recipe", they turn out to be spicy, salty with a sour taste. At the bottom throw some spices. We fill the barrel with tomatoes, put cloves of garlic, dill, currant leaves between the layers. Dissolve the salt in water and salt the vegetables. Cover with gauze, leave in the cold under oppression. We take the sample in three weeks. Deciding to pick up barrel tomatoes for the winter, it is best to choose a tub of oak. It is this tree species that provides the necessary access to oxygen, is a strong antiseptic, prevents the multiplication of harmful bacteria. It also enriches vegetables with tannic substances, which prolong the shelf life. But wood from coniferous species can give unpleasant "bitterness" to pickles. Features. Cask tomatoes are prepared in cold fashion with mustard, but instead of pickle, tomato paste is used here. Thanks to this approach, soft salted vegetables with a sweet taste are obtained. Perfectly combine with meat dishes. Half the vegetables are twisted in a meat grinder. In puree we add salt, mix well. The bottom of the container is filled with grape leaves, dill. We lay vegetables, supplementing them with spices. The last layer - leaves of grapes and pouring from tomato puree, mustard. We leave in the cold under oppression. After two or three weeks we taste it. Mustard is used to ensure that the blank is not covered with mold. Avoid its appearance can be, if the vegetables are topped with a few spoons of vegetable oil. The usual gauze, which is put on tomatoes, also helps. Features. For this recipe, the best sort is "Cream". Vegetables are fairly dense, well salted. The workpiece turns out to be sharp, so it is not recommended for the children's menu. leaves horseradish, mint, black currant, grapes, cherries. We spread the third part of the leaves to the bottom of the tub. We fall asleep tomatoes to half of capacity. Top with leaves, half pepper and garlic. Report the vegetables to the end. The last layer is made from the remaining seasonings and spices. We put a container with an oppression in the cold. Vegetables should be placed as tightly as possible. Otherwise they can turn out to be too salty. Therefore it is very important to choose the capacity of the required capacity. Features. Not only ripe, but also unripened vegetables possess excellent taste qualities. Unlike the red ones, green tomatoes are not deformed. The appetizer turns out to be sharp enough and suitable for those who like "burning" dishes. The whole stuffed fruits look beautifully on the festive table. We start with the filling: small cut celery, cabbage finely shred, garlic is slice thick slices, and bitter pepper - thin rings. Stir the products and leave to infuse for 30 minutes. We prepare the brine: add salt, bay leaf, a little dill, sweet peas to the boiling water. We keep on fire seven minutes. Marinade filter and cool. We make cuts in tomatoes and put stuffing in them. Fill the vegetables with a barrel, shifting the layers with the remaining dill. Fill with marinade. Close the lid and put oppression on top. We leave in the cold. Pickles will be ready in 25 days. Using the recipes of cask green tomatoes for the winter, you need to choose the right vegetables. It should be tomatoes of one kind and approximately the same size. An important parameter is the degree of maturity. Only one red, green or brown tomato should be in one container. Do not forget that they should be rinsed well before laying in the barrel. Do not use products with signs of disease. In the limited space of the apartment to install a barrel is not possible. The proceeds come from other utensils - pots, buckets, cans. Pickles in such containers are obtained not less tasty than in wooden tubs. Features. This is the way to prepare salted tomatoes in a saucepan as a cask. If there is no room in the refrigerator, then we put the capacity on the balcony. You need a saucepan for 18-20 liters. leaves of black currant, cherry and horseradish, dill. Onions and peppers are cut into rings. Fill the tank with tomatoes. Between them we form three layers of seasonings and greenery: the bottom, the middle, the top. For pouring: dilute salt and sugar in water (18-20 liters depending on the volume of the pan). We taste it, since the pickle should be fairly salty. We fill the brine with vegetables so that it completely covers the tomatoes. Cover the lid, and put the load on it. You can try in two to three weeks. For pickling, an enamel saucepan is suitable. It is recommended that you first check it for damage. If there are traces of rust, small holes, then this capacity is best not to use. The coating should be solid, without scratches and chips. Otherwise, the oxidation process will begin and the harmful components will be absorbed into the vegetables. Features. Make the cask tomatoes in a plastic bucket is not difficult, if you prepare the container correctly. Beforehand, you need to wash and dry the container well. Pickles are prepared in a product made of transparent plastic with a volume of 4-5 liters. So you can follow the process of fermentation. It is recommended to eat vegetables as soon as possible after the lid has been removed. They very quickly lose elasticity, turning into a gruel. In warm water we dissolve salt, sugar. Leave the brine to cool. Pepper is cut into large slices, onion - rings, horseradish - shavings. We stack vegetables with layers: tomatoes alternate with other components. Fill the marinade, close the lid and crush something heavy. After two weeks, we test the workpiece. For pickles it is recommended to use water from a well or a spring. But in urban conditions, this is not a dream. Therefore, the liquid from the water pipe is pre-boiled and filtered. An alternative to it is carbonated water from the store. Before use, it must be "exhausted". Features. Tomatoes in the bank, prepared in the fall, can stand until April. A long shelf life is provided by aspirin, which prevents bacteria from multiplying. Vegetables in a glass container wander and turn sour and slightly harsh. In boiled water, add sugar, salt, bay leaf, bell pepper. Remove from the stove and pour vinegar. Laying begins with greenery, spices. Then we fill with tomatoes, we throw powdered powdered aspirin from above. Fill brine, close with capron lids, leave in the cold. We try the vegetables in two to three weeks. Aspirin is a drug, so it can cause side effects. It is not recommended to use pickles without sterilization with medication for those who suffer from diseases of the gastrointestinal tract, has an individual intolerance. What should I do if there is only a bucket with chips and stains of rust? Prepare the cask tomatoes at home can be even in an improper, seemingly tare. To do this, special polyethylene bags for pickling are sold in stores. 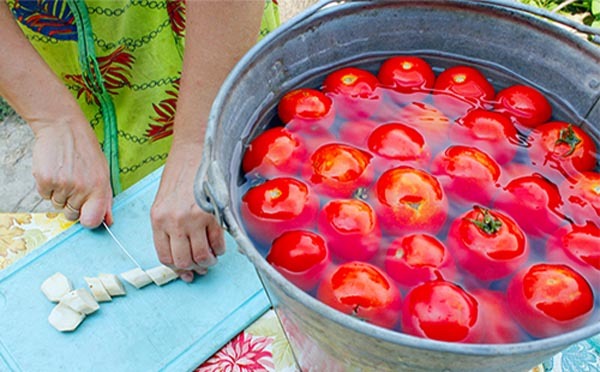 At first tomatoes are put in a bag, and then it is filled with a pan, a barrel or a bucket. Thus, vegetables do not absorb harmful ingredients, foreign smells or tastes, since they do not touch the walls of the container.